MountAndDoMe. It's a hilarious spin on the famous brand name soft drink logo and that makes for funny t-shirt nirvana. Our MountAndDoMe Shirts are loaded with tongue-in-cheek humor that never gets old. You can't go wrong with classic logo spoof t-shirts and MountAndDoMe belongs in any collection. MountAndDoMe Shirt looks terrific on any color material and is fun to wear out to clubs or just about anywhere. An instant t-shirt favorite for so many people, MountAndDoMe is a must own for your t-shirt collection. Makes a great gift too. Check out our cool MountAndDoMe hats, keychains, buttons and posters too! 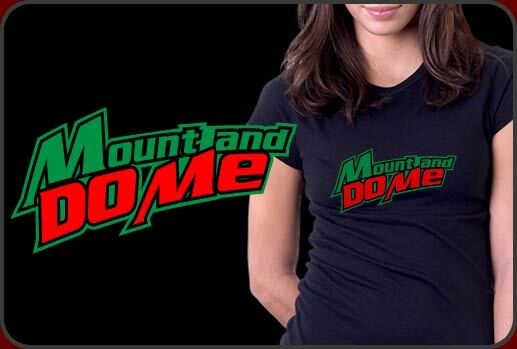 We have loads of awesome MountAndDoMe merchandise to choose from.